Hilton Head Cabanas is a short walk to Coligny Beach Park and Coligny Plaza which offer a great variety of shops and restaurants. Welcome to Hilton Head Cabana 26!! This well cared for and tastefully furnished town home is located along South Forest Beach Drive and is just a short walk to the beach. This villa is unique to other villas at this property in that it offers two and a half bathrooms. The first floor features an open floor plan complete with tile and wood flooring, totally renovated kitchen with newer cabinetry, granite counter tops, and full size appliances; located just off the kitchen is a stack-able washer and dryer. There is a powder room just off the dining area of the main level of this villa. The living room has all new furniture with a queen sleeper sofa with a flat screen television and a dining area with seating for four people. From the living room, sliding glass doors open to a nice patio with a gas grill and chairs overlooking the courtyard. Both bedrooms are on the second floor. The master bedroom is furnished with a king size bed, flat screen TV, and private bath with a shower/tub combination. The guest bedroom has two twin size beds, flat screen TV, and private bath with walk in shower stall. Additional amenities for this property include free WiFi and complimentary access to the Player’s Club for use of their fitness center and indoor heated pool. 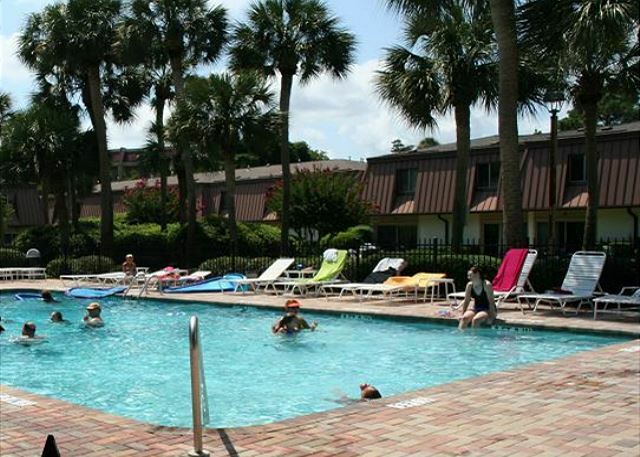 Rooms Sleeps 6, 2 Bedroom, 2 1/2 Bath, Poolside Hilton Head Cabana, beach oriented town home, full kitchen, washer and dryer, pool and health club. Adorable condo, had everything needed for a comfortable stay, enjoyed the fitness center. overall, it was a great place. If we decide on HH again though we'll be looking for a place where our kids can swim, for Michiganders spring break is prime swimming season, so we expected the pool would be open. WE were right across the street from the beach Everything was in walking distance the people were very friendly. We had a wonderful time. Very nice place a little far from the beach but I would definetly stay here again. Clean and comfortable! Enjoyed our stay! Loved our stay here this summer! The walk to the beach was short and easy with our young children. The in unit washer/dryer was very convenient. The unit was clean and updated! We have been renting from Vacation Time for the past 17 years. Vacation Time offers many different condo locations around the South Forest Beach area and we have stayed in many different units. We believe the HHI Cabanas work best for us. The location of the Cabanas, the beautiful center landscaped pool area, it's proximity to the beach and shopping mall are all fantastic. Unit 32 is absolutely fabulous. It is definitely the best Cabana unit we've stayed in. The layout, number of bathrooms, amenities are terrific.